Every year, perhaps even every week, there is some new gadget, device, service, or other digital offering intended to make our lives easier, better, more fun, or more instantaneous--making it that much harder to question how anything digital can be bad for us. Digital has created some wonderful things and we can hardly imagine life without them. But digital—the most relentless social and economic juggernaut humanity has unleashed in centuries—is also destroying much we had taken for granted. And what is your place in this brave new world? In Digital Is Destroying Everything, futurist and digital marketing consultant Andrew Edwards tours the “blasted heath” digital is leaving behind and takes a fearless look at the troubled landscape that may lie ahead. The book is not, despite its title, a dystopian rant against all things digital and technological. Instead, expect to find a lively investigation into the ways digital has opened us to new and sometimes quite wonderful experiences, driven down costs for consumers, and given information a chance to be free. But the book also takes a clear-eyed look at many of the good (and sometimes bad) things—businesses and behaviors—digital has destroyed, and how the world may be diminished, compromised, and altered forever in its wake. This tour of the effects of digital technologies on our lives is sure to raise questions, touch a nerve, and enlighten even the most dedicated digital enthusiasts. Digital has created some wonderful things and we can hardly imagine life without them. But digital—the most relentless social and economic juggernaut humanity has unleashed in centuries—is also destroying much we had taken for granted. And what is your place in this brave new world? 11: Digital Has Destroyed Authoritarian Rule (or Has It)? Digital marketing executive Edwards has some valid. . . .points to make about the wide-ranging effects of digital communications technology. According to Edwards, the ever-growing role of the online world has crippled brick and mortar retail, endangered the future of cities, weakened human connections, exterminated privacy, and made perpetual underemployment almost inevitable—and that’s just a partial list. Edwards does acknowledge the hyperbole of the title and the book’s general thrust; the penultimate chapter. . . .enumerate[s] how the interconnected world has changed lives for the better. He notes how hard some things were before the digital revolution, and believes that it’s 'possible that digital is the equivalent of agriculture in the evolution of the species.' Despite this effort at balance, readers will come away with a growing sense of unease at how insidiously digital advances have invaded our lives and modes of thinking. Futurist and digital-marketing consultant Edwards uses 'digital' to describe IT without ranting, but rather exploring. Stating, 'Digital entrepreneurs . . . with the Darwinistic ethos of Silicon Valley . . . seem to believe their achievements approach a condition of natural law driven by their . . . gold rather than the digital utopia they . . . suggest they’re creating.' He sees piracy as seriously compromising cultural arts, yet also perceives a micro-fan-based business model that is more successful than stadium concerts. While mourning newsprint shrinkage, he claims, 'digital took away the ad dollars—newspapers took away the news' by cutting resources, yet acknowledges that one cannot readily share articles from newsprint while digital news thrives in the virtual space of global social-media interaction. Perhaps most tellingly, Edwards analyzes Amazon’s customer relationship value with its 'first mover' business model: investor-subsidized low prices increase the number of buyers and destroy competitors, thus allowing the first mover, as the remaining source, to raise prices 'almost at will.' Hence, digital-market hegemony via global reach is the long game, which is harmful to consumers. A thought-provoking and controversial analysis. With Facebook, Twitter, blogs, and the proliferation of cell phone apps, the digital age has created a revolution in lifestyles, education, finance, retail, and politics. In this book, Edwards, a digital marketing executive, investigates both the good and the bad of this new digital world. The good is easy to understand: lower costs of goods and increased communication. The bad involves reshaping the economy in potentially undesirable ways. Edwards includes chapters on digital threats to record companies, newspapers, photographic studios, and artists. Through his tour of the digital world, the author argues that Amazon transforms retail, MOOCS (massive open online courses) challenge universities, blogs alter politics, and telecommuting alters urban life. Privacy is often compromised when millennials are more willing to share their private information with others and governments request personal information to enhance security. According to the author, one key to reducing digital challenges is to have more face-to-face meetings. The book contains many references to current events published in popular newspapers and magazines. . . .Summing Up: Recommended. Lower-division undergraduates through professionals and practitioners. Human interaction seems to be deader than dead. How many dinner times are silent because everyone in the family considers the happenings on their tiny screen to be more important than the person sitting across from them? Is personal privacy an obsolete concept? Political discourse has become balkanized, in that believers in nearly anything can put up their own website (or websites) and tell themselves that they are right, and everyone else is wrong. What can a person do about it? Reduce Your Digital Exposure. Leave your smartphone off until you actually need it. This is an excellent and eye-opening book. It should be read by everyone, especially by those who have to check Facebook (for instance) every few minutes. This book is a crash course in the emerging problems of digital technologies. Education, politics, retail, financial services – all suffer as a result of ‘digital,’ but there is hope – some jobs will never get digitized. The hope is in consuming less of digital and adapting digital to us, rather than adapting to it. Living within earshot of the locomotive’s whistle, Thoreau reminded us that wildness is the tonic for civilization. Both Walden and Edwards' Digital deserve to be read outdoors, in nature, and then discussed with friends. In this age of big data and digital analytics, Edwards questions our idealization of changes produced by digital technologies. While updating the reader about how digital technologies are altering many industries and particular ways of life, this book highlights the centralization of power and the lack of human context that has ensued. It provides an overview of the far reaching consequences of the digital revolution and asks us to reevaluate the role of digital technology in our lives. Andrew Edwards never takes anything at face value and forces one to re-see, re-view and re-think basic assumptions about all things Digital. Digital Is Destroying Everything offers an important, historical perspective, crucial for understanding where Digital is taking us next. Whether you feel you have been a part of the digital revolution or not, it has more than likely changed your life. The last 25 years have been a whirlwind, it’s time to take a short break and read this book! Andrew’s style is only overshadowed by the wealth of information he has aggregated within the text. The Music Industry, Education, the Job Market, Retail, even Urban Life and Human Interaction have all evolved and Andrew walks you through the how and why with ease. A read that is not only informative but also extremely entertaining. See you at the end! 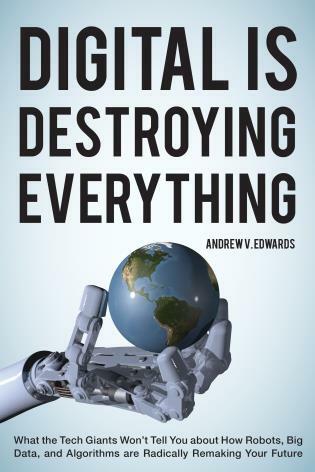 Andrew’s important book weaves together business and social observations and commentary into an informative, compelling, and critical expose about how the pervasiveness of digital technology has, is, and continues to disrupt not only entire industries but the global economy too. Far removed from being a solely Utopian (or dystopian) view of digital destruction (and digital construction), Andrew explains in eloquent prose his futurist ideas on what digital is doing to our shared world today, how it may lead to a different version of tomorrow’s digital future than you may expect, and why governments and humanity should care – before our robotic overlords care for you on your behalf. Tie down your industry and hang on tight to it, because if it can be digitized it can be destroyed… Or simply transformed and recreated. The choice of whichever way you want to view it remains your own. What Andrew Edwards does in this book is lay bare the facts that digital can be as destructive as it can be transformative (and vice versa). For a guy who admits to earning his daily crust in digital business, he also has no problem giving it a black eye when he thinks it deserves it. A scary title for a book packed with insight from a guy who understands that digital does what digital is. Cut and paste that directly into your brain!